This chapter deals with the topic of medical decisions and decision-making that occur at the end of life and have the potential to allow the patient to die or hasten death. These decisions include: withholding and withdrawing treatment, intensified management of pain and other symptoms, active shortening of life without explicit patient request, euthanasia, physician-assisted suicide, and voluntary stopping eating and drinking. Evidently, such decisions are subject to considerable ethical deliberation and scrutiny, apart from their applicability in the legal framework of some jurisdictions. 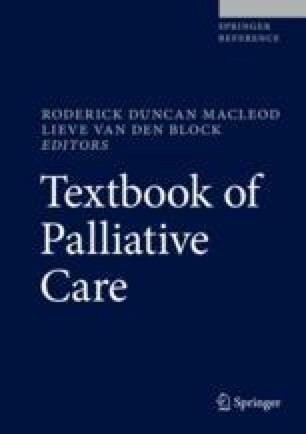 In this contribution, the main ethical principles – autonomy, beneficence, nonmaleficence and justice – are considered in the context of end-of-life decision-making. We go on with a discussion of intensely debated special topics such as: proportionality, the principle of double effect, (medical) futility, nonabandonment, and vulnerability. Next a glossary is provided of the most pertinent issues inherent in each type of end-of-life decision. Examples include: opioid phobia in pain management, the “slippery slope” argument in the assisted dying debate, and the relationship between palliative care and assisted dying. Finally, attention turns to a number of important topics related to communication in end-of-life decision-making: truth-telling, shared decision-making, advance care planning & advance directives, conflict, and cultural issues.